Wash and rinse mutton, cut in to cubes and pressure cook it with salt, red chilly powder, garam masala, cumin powder, pepper powder. Meanwhile do cubes pieces of boiled potatoes and keep aside. Now make a fine paste of coconut, green chillies, and salt. Heat a wok put 2 tbsp of oil, add coconut paste, ginger – garlic paste, salt and mix it well. After 5 minutes add potato cubes and mutton cubes sautÃ© it till everything is mixed nicely. When this mixture gets cooled than thread mutton and potato cubes on to skewers alternately. Beat egg in a bowl with a pinch of salt. 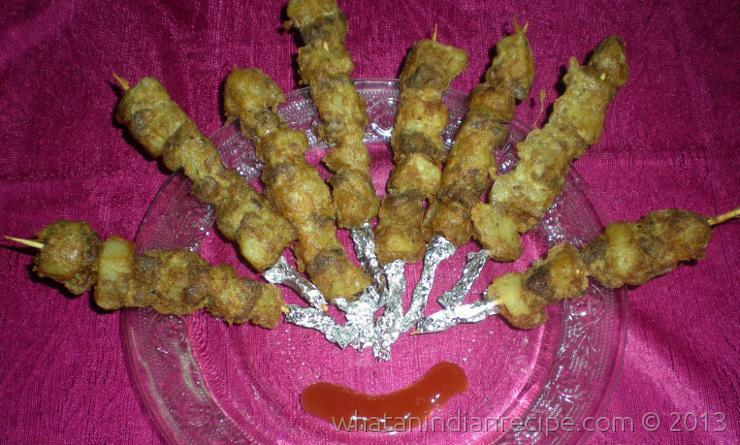 Dip the mutton skewers in egg and shallow fry in hot oil till golden brown.